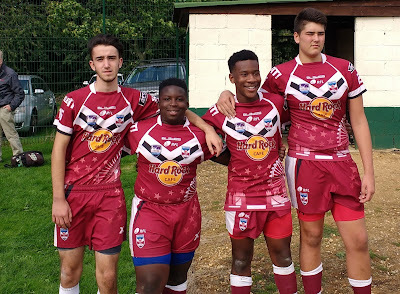 Here are the Old Ruts boys who played in today's South London win over North London in the Rugby League Origin Series U15s. From left to right: Ben, Wesley, Saadiq and Billy. Tries for Ben and Billy, and massive performances from Wes and 'diq. Congratulations all round. I will be buying the DVD and I haven't even got a player any more.